If you’re looking for that WOW gift that will light up her face, In House Jewelers has something for you. Our knowledgeable sales consultants know just how to help you select the perfect gift. They start with questions about the occasion and about the recipient. What number birthday or anniversary? What is her birthstone and does she like her birthstone? Are you looking for something she can wear every day or for special occasions? 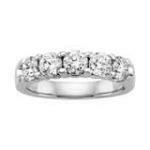 Does she prefer white gold, yellow gold, sterling silver or platinum? What types of jewelry does she wear already? Using the answers to these questions as a guide, the IHJ consultants will suggest several items that would be good choices. While the choice is yours, they can always guide you in the right direction and share their valuable insights. One of the most popular and requested gift items is gemstone jewelry, including birthstones. This is a wonderful way to personalize a gift. Birthstones can be featured in rings, pendants, earrings and bracelets for special anniversaries or birthdays. The gemstone can be that of the recipient or it can represent the birth months of children or grandchildren. Each and every birthstone has its own beauty and significant appeal. Typically a circle of small-to-medium-sized diamonds that is worn either with the wedding set or on the opposite hand, the circle symbolizes eternity. 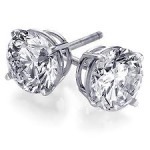 A pair of beautiful diamond earrings can go anywhere and always look glamorous. 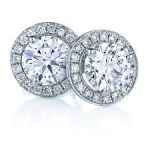 They can be diamond studs worn every day in a second piercing, or worn as the primary earring for special occasions. They will add sparkle and shine to every outfit, from casual to formal, and she will feel great wearing them! At IHJ, we take special care to be sure diamonds are mounted properly and earrings have secure backing to prevent loss. Versatile and breathtaking, the diamond tennis bracelet is a statement piece. It can be worn every day or for special occasions. No matter when she wears it, she will feel special. 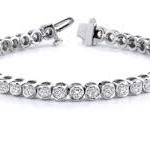 Make her feel comfortable with a double secure clasp and safety chain, so that the bracelet doesn’t slip off her wrist. Whatever you choose, it’s guaranteed quality from IHJ – from the moment you purchase it through the life of the piece.